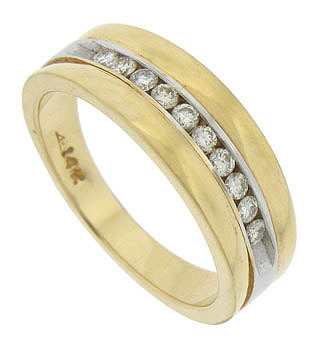 Ten sparkling, round cut diamonds are channel set into the face of this mens estate wedding band. 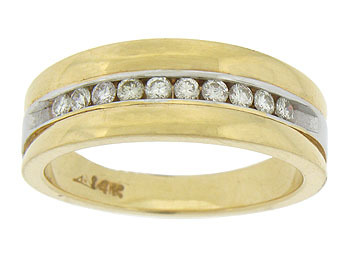 The handsome 14K bi-color ring is crafted of yellow gold with a center ribbon of white gold. 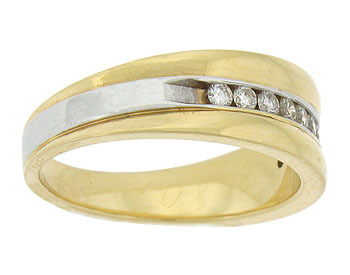 The wedding ring is brightly polished and measures 7.95 mm in width. Circa: 1970. Size 10 1/4. We can re-size slightly.